I thought to myself, "what the hell is this thing?" 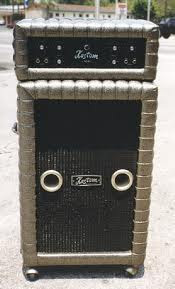 I had never heard of Kustom amps, but thats what they had. So I plugged it in and fired out a few notes and almost crapped my pants it sounded so awesome. I'm sure part of it was nerves and part of it was the beer, but our band sounded great that night. 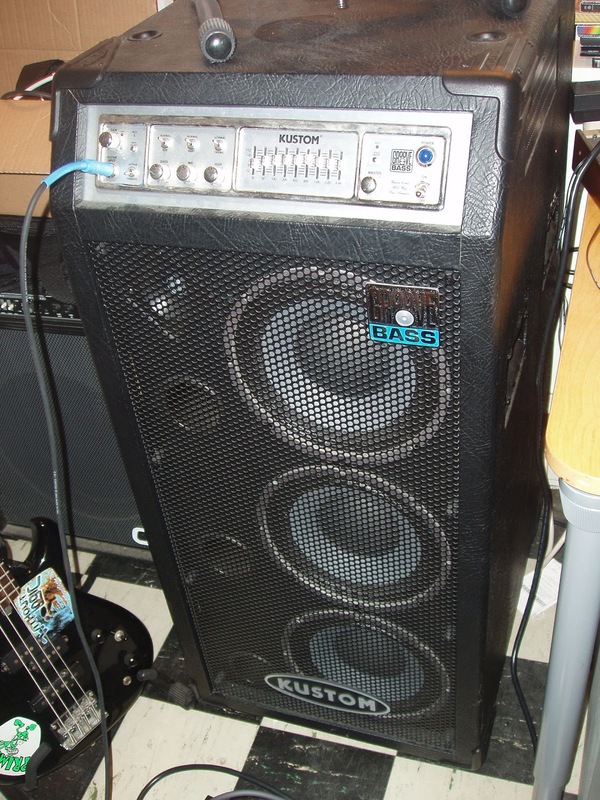 The next day I decided to start looking for a "gigging amp" and Kustom was where I started. At the time, I didn't feel I had the money or experience to dive into the cabinet/head arena, so I was looking for a combo amp of some kind. A combo amp with balls. Beginning the search with Kustom lead very quickly to the 310c. It was just under $500 brand new. I ordered one, sound unheard, hoping that it could hold a candle to my experience with the other Kustom amp at that first show. I think the candle was successfully held. I've had this amp about three years now, and I am still really happy with it. The 310c designation is for the three 10-inch speakers. The manual says it has 1200w output. I don't know exactly what that means, but I can tell you this thing is loud as hell. Actually, it might be as loud as two hells. Playing up against a half-stack and acoustic drums, I don't think I ever turn the thing past more than 1/4 of its output. It has a great sound which I think the 10-inch speakers help deliver: really great presence, with a growl on top and powerful bottom. As far as features and controls go, it is pretty comparable to my other amps. It has a gain knob and a switch for active versus passive instruments. It has three instant EQ settings for bass, mid and high, and also a 9-band EQ. It also has a mute button and a solo button (which boosts your volume by 6dB) which can be activated on the console or via a foot switch that comes with the amp. A master volume and on/off switch finish off the front of the console. On the back is a balanced line out for running into a PA, an effects loop send and return, and jack for a dedicated tuner. The thing is built like a tank. Pretty typical black vinyl over plywood/particle board structure. There are impact guards on all the corners. It has built in handles on the sides, and also built in casters on the back so you can tip it back like a furniture dolly and roll it around. Now I am a pretty big guy, but this thing weighs about 150 pounds (which is like 50-trillion grams or whatever the metric system uses). Getting it in and out of a car by yourself can be a challenge. It is also just large, and since it is a combo amp, it doesn't come apart. I could fit it in my old station wagon if I put the back seats down. So yeah, it's large. And heavy. I looked around to see if anyone had these for sale, and it seems like this amp has been discontinued. So used is how the Kustom 310c rolls now. 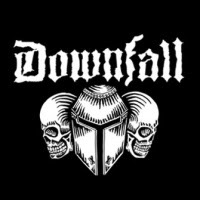 If you have a chance to check one out, or any Kustom amp, definitely give it a try. I'm kind of kicking myself for not buying one of the old school puffy-vinyl ones that popped up on Craigslist a few months ago. Next time maybe. dude!! 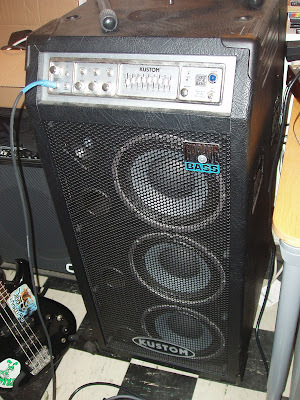 that puffy amp happens to be a Kustom tuck and roll amp built back in late sixties, credence Clearwater revival band relied on these bad boys for concerts, and recording sessions i'm a novice 63 yr. old bass player with a washburn bass, kustom 30 watt bass amp with a crate 2-10" with 5" midrange the whole house shakes when I turn it up with the mid range bass knob turned all the way up! I wish I had a tuck and roll bass amp u r one lucky dude!